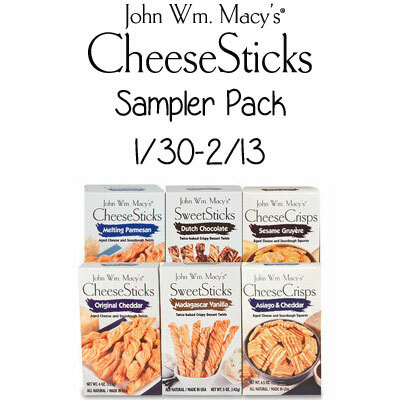 The Sampler Components: One 4-ounce carton each of Original Cheddar and Melting Parmesan CheeseSticks; one 4.5-ounce carton each of Asiago & Cheddar and Sesame Gruyère CheeseCrisps; and one 5-ounce carton each of Madagascar Vanilla and Dutch Chocolate SweetSticks. Dutch Chocolate sounds really good! I am most excited to try the Original Cheddar and Melting Parmesan. I would try asiago and cheddar first. Sesame & Gruyere cheese !! Asiago & cheddar — no contest! I would like to try the Sesame Gruyère CheeseCrisps. I would most like to try the Asiago & Cheddar. I want to try the Sesame Gruyère ones the most. Dutch Chocolate!! Who doesn’t love chocolate! !